WeatherExpert features models up to 23 tons, IEER ratings up to 21.0 and exceeds current ASHRAE 90.1 -2010 and Energy Star requirements. 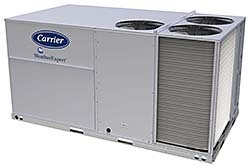 The units feature three stages of capacity control utilizing scroll compressors and ECM outdoor fan motors. They are available in gas/electric, electric/electric or cooling only.